Just as you wouldn't go to war without your equipment and weapons, you shouldn't fight in the Battledome without preparing yourself! To fight in the battledome, you need to have a pet. 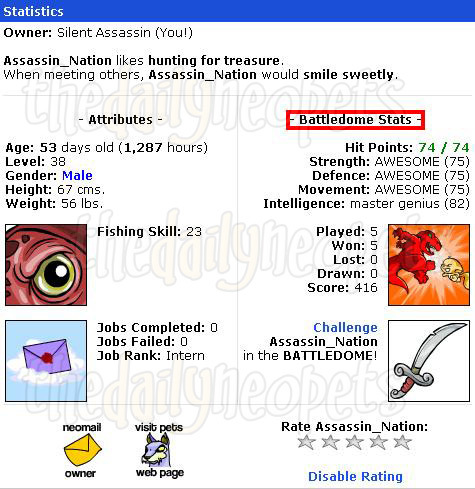 If you look at your pet lookup, you will see the stats of your pet. The higher the number, the stronger your pet. To train your pet, here is our Fast Training Guide. 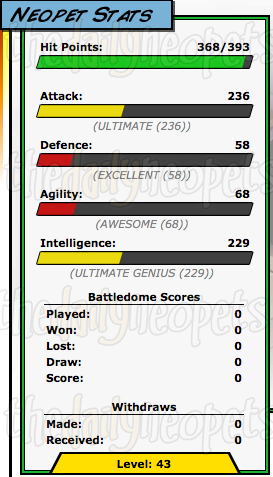 Additionally, you can have an alternate view of your Neopets' stats right in the Battledome, where you can view a more visual look at your pets statistics. Now that you have a pet, your next mission is to equip them with weapons. 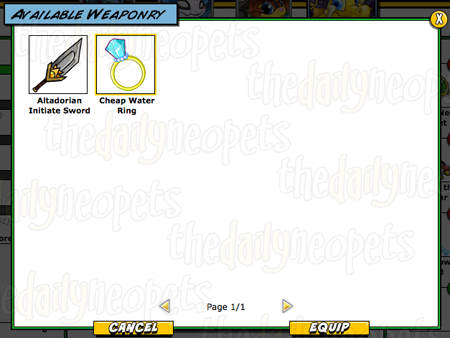 There are literally thousands of weapons around Neopia. Here is a guide for the basic weapon sets you might want. You can buy an Unstable Slime and a Skull and Crossbow for now if you don't know what to get. Weapons can be bought via the Weapon Shops, Shop Wizard or Trading Post. You can equip items from inside the Battledome. 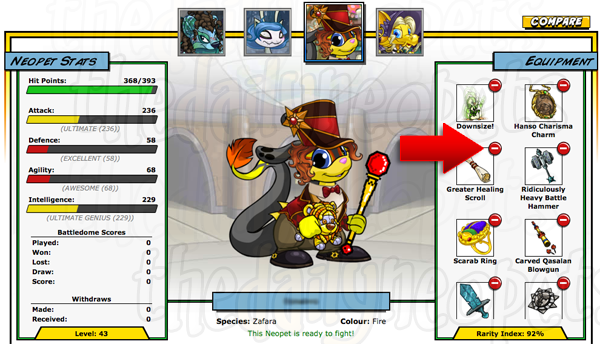 On the Battledome page, you can see your pet's weapons that they currently have equipped (if any). Click on the green plus icon to add a weapon. This will open up an additional pop-up that features all weapons currently in your inventory. Click the weapon you wish to equip and then click EQUIP. Repeat the process to add additional weaponry. If you want to remove a weapon, enter the Battledome. There, you will see all the weapons equipped to your pet. Beside each weapon will be a little red minus icon. Click the red minus icon of the weapon you wish to remove. Enter your PIN (if you have one) and click UNEQUIP. Weapons will also be removed if you pound or transfer your pet. All removed weapons will return to your inventory. 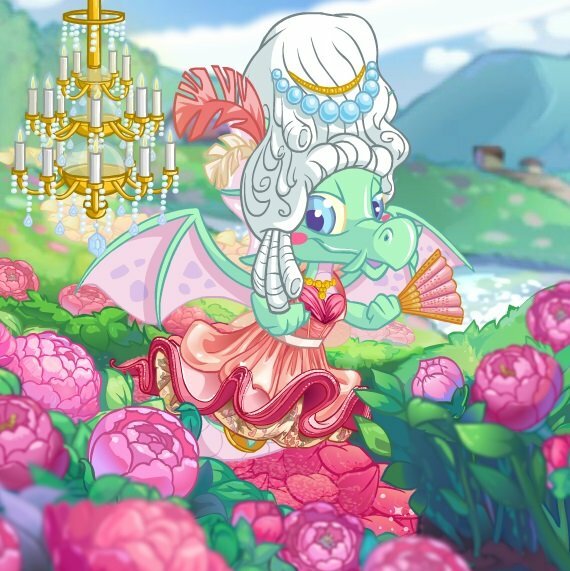 You've bought the bottled faerie, now what? Well, time to bless your pet to get a new ability! Just click on it in your inventory and click "Bless 'pet name'". This will bless your pet with 1-2 points for a specific element. Then, you can head over to Aethia's Ability Academy to spend your points on abilities! Here, you can see how many points you have for each element and what abilities are available to you. You can purchase abilities with the skill points. The cost of the ability is displayed on the right side of the ability icon. To purchase an ability, make sure your desired pet is selected at the top. The selected pet is slightly larger than the others. 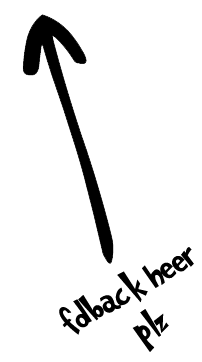 (In the example above, the Uni is selected.) Then, click on the icon of the ability or abilities you would like to purchase. Then, scroll down and click "Train These Abilities." 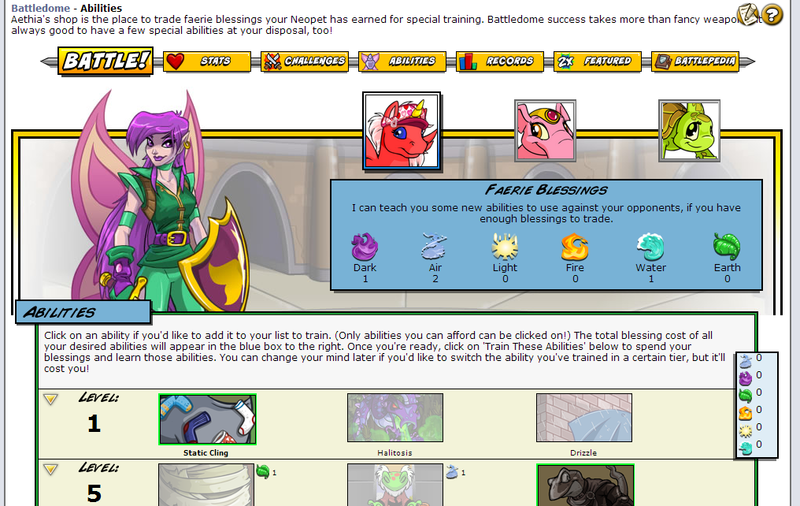 Aethia will train your selected pet in the selected abilities, and they'll be ready for you to use in the Battledome! Abilities are arranged in tiers according to levels. If your pet is above the level requirement, you can train the ability. In the example above, the pet's level is between 200 and 300, so the abilities from the Level 300 tier are locked. You can click on a locked tier to see what abilities are available, but you will not be able to train them. You can train your pet in one ability per tier. 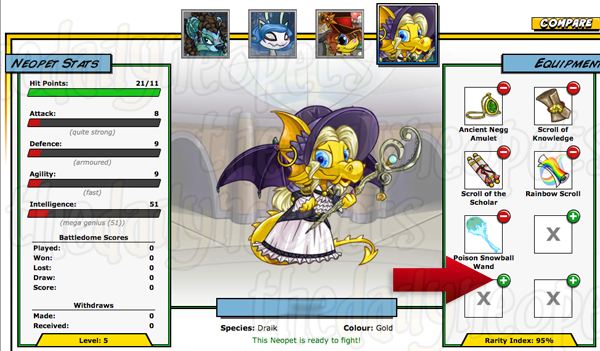 Once you've trained a pet in an ability, that ability will be highlighted on your page, with no cost next to it. The pet in the example is trained in Warlock's Rage. Also, once your pet is trained in an ability in a certain tier, the other abilities are available for training at half price. For example, Snowager's Breath typically costs 25 water points and 15 light points, but to a pet that's already trained in Warlock's Rage, it only costs 12 water points and 8 light points. However, if you do train an ability at half price, you will lose the previously trained ability, since you can only have one ability per tier at a time. To find out what each ability does, read our Faerie Abilities guide.